VTR is a blue-chip REIT with a strong balance sheet and high-quality diversified healthcare real estate portfolio. Management has been recently selling off non-core properties to deleverage, build up dry powder, and grow the promising life science portfolio. While a lack of growth is uninspiring, the 5% dividend yield is “rock solid” and should continue to grow with inflation over time. Income investors looking for a secure 5% yield and a solid long-term outlook should give VTR further consideration. Given management's focus on pruning the portfolio, deleveraging, and accumulating dry powder, investors looking to build wealth at a quicker pace should look elsewhere. However, Ventas is a highly attractive choice for risk-averse income investors, such as retirees, that are interested in investing in REITs. VTR is one of the leading landlords of healthcare-focused properties in the United States and has compiled a diversified portfolio of ~1,200 properties across the senior operating, medical office, triple net lease, life science, and lending sectors, and has well-established relationships with leading senior housing and healthcare companies as well as scientific research institutions. These relationships are one of the main reasons why the company's performance has exceeded that of peers over the years. Another feather in VTR's hat is its management's record of prudent capital allocation. Indeed, it is hard to find a company with a more decorated leadership team. During the current CEO's two-decade tenure, shareholders have received an astounding total market return of ~4,700% (20%+ CAGR), far outpacing the broader market over that time frame. One of VTR's secrets to success is its ability to combine its extremely low cost of capital and easy access to capital with its diversified portfolio to achieve optimum allocation through market cycles. The company demonstrated this with its spin-off of its skilled nursing facilities assets ahead of the industry's decline and instead focused on allocating capital to promising growth opportunities in NNN, Life Science, and Medical Office while pruning its portfolio to enhance operator and property quality. VTR's largest segment - senior housing - is currently undergoing challenges, significantly weighing on the company's otherwise solid results. With limited barriers to entry in this sector, a supply surplus has resulted in poor tenant performance and rental and property occupancy rates. However, new construction is slowing and - once the "Silver Wave" (i.e., the large number of Baby Boomers reaching the age where senior housing is typically needed) hits over the next 5-10 years, balance is expected to be restored to this market. Additionally, while retaining its Senior Housing "SHOP" portfolio has weighed on results in the short term, management maintains its importance as a significant portion of the portfolio, given its recession resiliency (as demonstrated by the fact that it was the only healthcare sector to display positive NOI comparable growth each year during the financial crisis). Furthermore, the Brookdale agreement provides a bridge to the upcoming "Silver Wave" by restructuring 128 communities leased from Ventas under a single master lease and security agreement. Additionally, management emphasized recently that senior housing remains affordable and competitively priced against alternatives and that cheaper options within the space will likely emerge in the future, further bolstering demand. The company's second largest business segment - triple-net lease properties - have long contracts (typical initial lease terms of 12-15 years) with annual CPI-linked rent increases that place all operating expense responsibilities on tenants and are often structured under a master lease (i.e., multiple properties grouped together under a single lease to a tenant and are also renewed as a group, thereby greatly increasing switching costs) making them more conservative than the senior housing portfolio. This segment has been experiencing steady growth as a result. Medical office and life science properties - VTR's two smallest business segments (other than lending, which is more opportunistic and relationship-driven than an established business segment anyway) - are also steady performers, and management is particularly excited about the opportunity for growth and strong risk-adjusted returns in the life science portfolio where the company is partnering with premier quality research institutions. 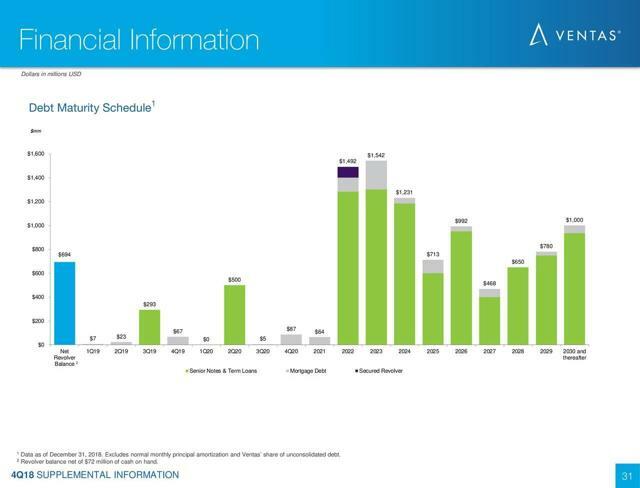 However, despite the steep FFO per share decline forecast for this year, management claims that 2019 will be a "pivotal" year for VTR in returning to growth based on their conviction that the senior housing sector will bottom this year and the supply-demand equation will begin becoming increasingly favorable in 2020 and beyond. This confidence stems from favorable secular trends. One of the major risks facing VTR is the fact that it has significant tenant NOI concentration, such as Altria (18%), Lillibridge (11%), and Brookdale (9%). If problems arise at these operators, VTR's rental revenues could be significantly impacted. This potential issue was already witnessed with last year's special agreement between VTR and Brookdale in order to keep their properties occupied. This leads to the second significant risk for VTR: the uncertainty surrounding its senior housing portfolio (the largest in its overall portfolio). The aforementioned high supply growth has led to declining occupancy and NOI in many properties in the sector. As a result, the company is counting on supply eventually being absorbed by growing demand. However, the extent and timing of this rebalancing - if it occurs at all - remain to be seen. Until then, this business segment will weigh heavily on results. 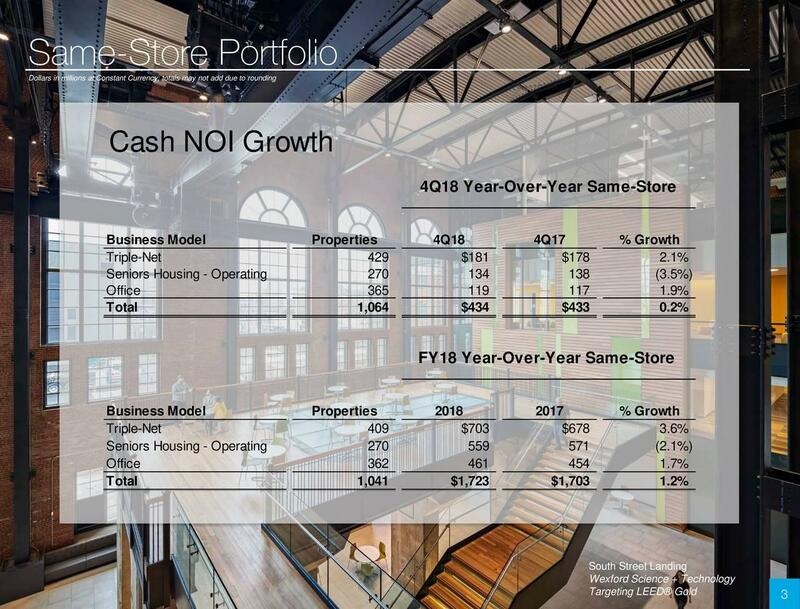 "rent escalators are assumed to be partially offset by expected lease modifications with certain smaller senior housing operators where rent coverage and credit is challenged... a $10 million NOI reduction in our triple-net same-store pool equating to 130 basis points year-over-year same-store impact." 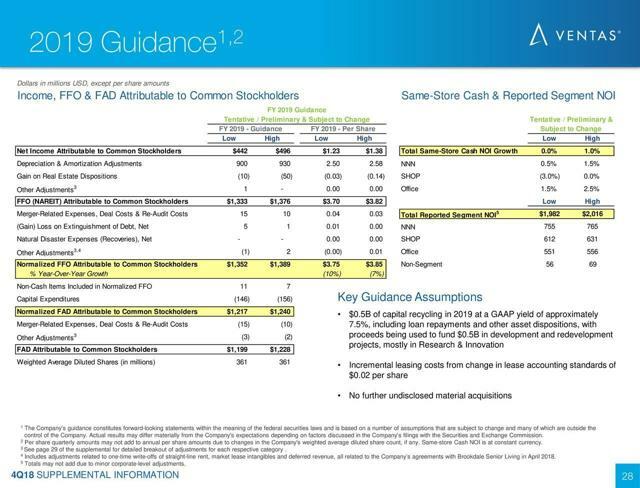 Despite its challenges in senior housing and overall FFO shrinkage, VTR's dividend remains (in the words of its CEO) "rock solid." 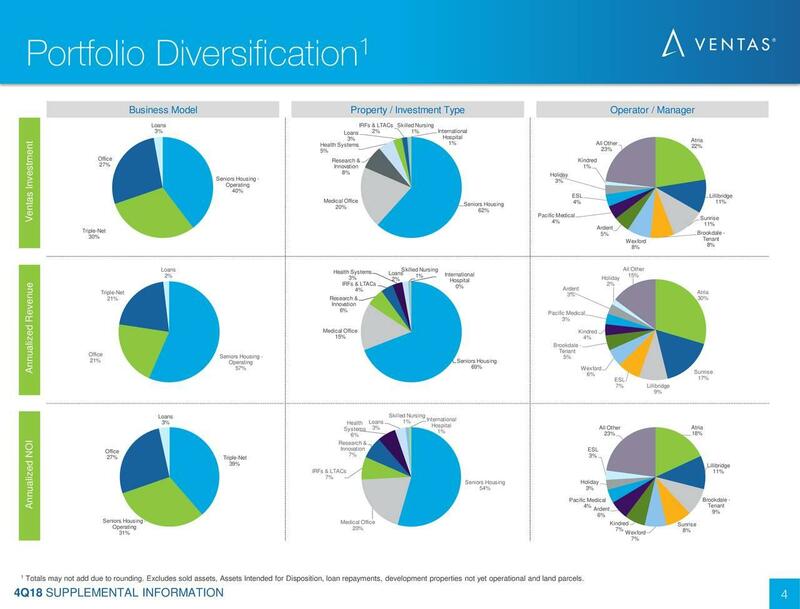 While the payout ratio is climbing due to a combination of some dividend growth and shrinking FFO/share, it still remains manageable at 83% (based on the midpoint of guided 2019 normalized FFO/share), especially considering the defensive, diversified, and quality nature of the portfolio and the soundness and liquidity of the balance sheet. In fact, its senior housing portfolio was the only property sector during the last recession to experience uninterrupted NOI growth, supporting the company's cash flows and dividend, while many other REITs were experiencing steep declines. That being said, the dividend payout ratio is high enough, and FFO/share growth is currently non-existent, making robust growth in its payout highly unlikely in the near term. As a result, investors should have tempered expectations for dividend growth, at least until the "silver wave" hits and/or the senior housing issues are resolved. However, management seems committed to maintaining its long-term track record of growing the dividend over time, making this REIT a reliable long-term dividend growth machine. Therefore, if investors are merely looking for a very safe and recession-resistant 5% yield that will grow at or above inflation over the long term, VTR is an excellent choice. 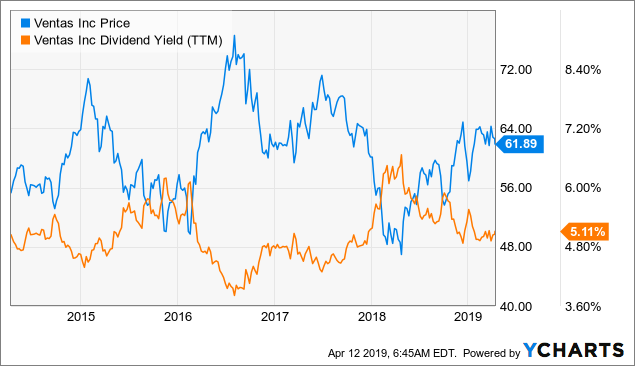 As can be seen below, VTR's dividend yield and price are not particularly attractive or expensive at the moment.